One of the little projects I’m thinking of for 2011 is to create a recipe book with a slight difference. I love cooking, but for me, the process often requires very loud music as accompaniment; so that stirring, chopping, blending and slicing is interspersed with a little bit of dancing, a little bit of singing, possibly a bit of mild or manic head-banging (depending on the recipe). Then you have the perfect way to spend an afternoon. So I had this idea to create a book of recipes that I liked with some recommendations of tunes to accompany the cooking and eating process. Especially if it’s a little culinary round-the-world trip as I quite like theming my music with the country from which the recipe originates. So this is the first. Pancakes with grilled bacon, blueberries and maple syrup. I don’t think I need to tell you much more about how to throw it together. Make the pancakes if you will but Greggs had them six for £1 and they were mighty fine. 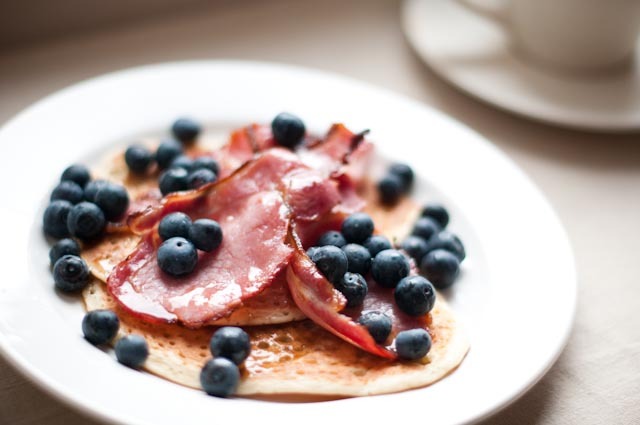 Heat the pancakes, grill the bacon, put on a plate, scatter a generous handful or two of blueberries on it, drizzle with maple syrup and you have THE best leisurely, decadent weekend breakfast. I first has this at some friends so not sure where it originates from but I think it has a bit of an Antipodean flavour to it, so swing open your windows, let in the sun (if it is obliging), make yourself a large pot of coffee and I recommend a bit of Bic Runga’s Beautiful Collision as nice, gentle morning music to accompany this. We can leave the head banging for later in the day.